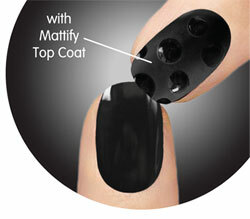 Add Mattify Top Coat to any Just Gel Manicure to create a matte, velvety finish. Just Gel Polish introduces new Mattify Top Coat for creating contour, multiple tones and art designs. Apply Mattify Top Coat where you desire a matte, velvety finish, giving a variety of textures to your nail designs. Just Gel Polish Mattify Top Coat offers a new modern finish for gel polish manicures to create different looks with contour and depth. Design art with shine and matte effects for an ultimate fashion statement. Apply Just Gel Polish Base Coat. Cure for 30 seconds LED or UV cure for 1 minute. Apply 2 thin coats of Just Gel Polish Color, LED cure 30 seconds or UV cure 2 minutes. Cure each coat separately. Apply 1 coat of Just Gel Mattify Top Coat, LED cure for 30 seconds or UV cure for 2 minutes. Apply Just Gel Polish Top Coat in desired design after Mattify Top Coat to create two tone nail art using a striper brush or dotting tool, LED cure for 30 seconds or UV cure for 2 minutes. Just Gel Polish Mattify Top Coat looks best on medium to dark shades where you can really see the contrast and velvety finish.